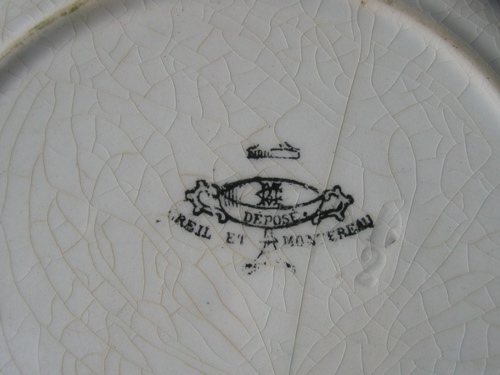 Creil Montereau plate about velocipede. Plate Nr 1, called : "Depuis le temps des diligences, les affaires n'ont jamais si bien été que depuis la vague des vélocipèdes". This opaque porcelain plate belongs to a satirical caricature of velocipede lovers. The center is transfer printed decorated in black on white body. The edge is green colored and a ornated with a palm leaf pattern, moulded into the body. Mark stamped in black ink under the glaze on back. Circa 1885. In excellent condition, no damage. Dimension : diameter 19,5 cm. The earthenware decorated with black transfer printed playlet, were very successfull during XIXth century. Creil and Montereau is well-known such as Gien, Bordeaux or Choisy-le-Roi, for the artistic quality and the great variety of patterns. The beginning of cycling is treated here with humor. This series of plates will be perfect for dandy-horse enthusiasts ! An occasion to go back in time with these machines of another age which made the first cyclists dream. This product was added to our catalog on Thursday 26 May, 2005.